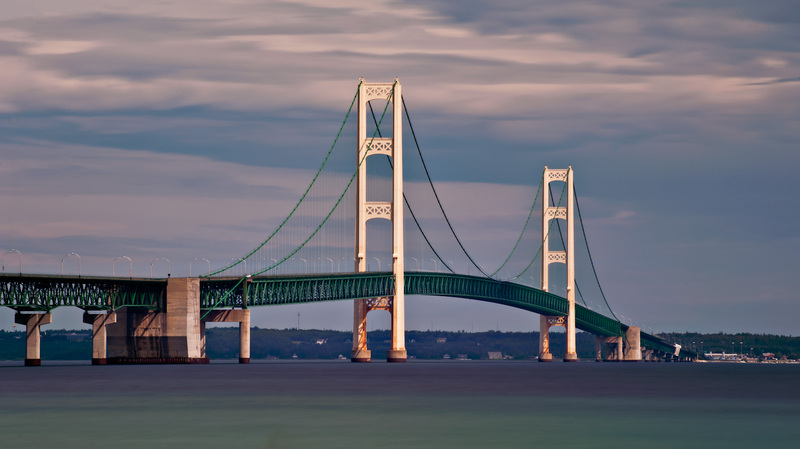 The Mackinac Bridge in northern Michigan is the third longest suspension bridge in the world and is the longest suspension bridge in the western hemisphere. The suspension part of the bridge is 8921 feet and the total length of the bridge is 26, 372 feet. 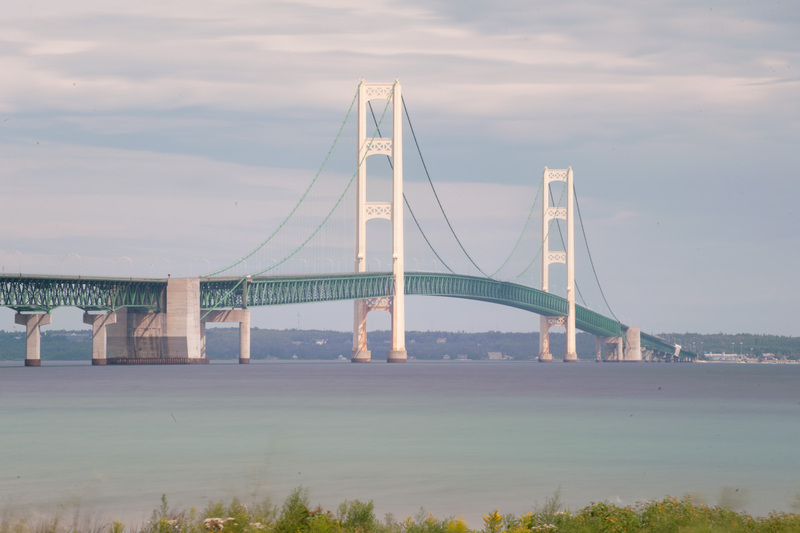 The bridge was built to connect Michigan’s lower and upper peninsulas. The bridge spans the Straits of Mackinac which is where Lake Michigan meets Lake Huron. The concept for a bridge at this location had been pondered since 1884, but wasn’t built until 1954. The bride opened to traffic in 1957. One of the fun events surrounding the bridge is the annual Labor Day ‘Bridge Walk’. Each Labor Day, half of the bridge is dedicated to foot traffic and you can walk the bridge starting on the north side. The middle lanes of the bridge are made out of a steel grate to let the wind pass through. As you walk across the bridge, it is interesting to look down through the grate at the water below. If you’re lucky, a freighter might be passing under the bridge at the time. This image was taken on a recent trip to northern Michigan. My wife and I had just come from the island (Mackinac Island) and we were headed out of town. We stopped at a local park so I could get some pictures of the bridge. It was a breezy day with some nice clouds so I thought I would try to take a long exposure aided by my 10 stop ND filter. Even at f/32 and 10 stops, the best I could get was a 15 second exposure. I think it did a nice job with the clouds, but it would have been nicer to have an even longer exposure, I think. Processing included cleaning up a ton of dust spots (I think from the sensor and not the filter), creating more of a panoramic crop and some basic image adjustments in Photoshop using onOne’s PhotoTools product. Comments or questions? Feel free to leave them below. Nice job on the processing. It’s funny, it looks like a wave. Great image James! I had no idea a bridge this massive could be found in the U.S.
What a gorgeous capture. Love the processing here.